scholarships and accomplish other community projects. ...was held Friday, March 17, 2017 and was a great success with great food and fun for all. What a party we had. Fabulous table decorations, thanks to all who contributed. Great food, thanks to all who delivered. And how about that army of volunteers, all focused, all smiling, all busy. I still don't know how Val Coulter recruited. My theory is, she promised them all a trip to Hawaii. Great job, Val. Did I mention we made $2,187 for our scholarship fund. 2016 was the best yet! 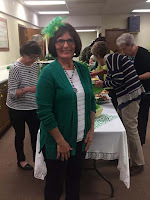 Our 9th Annual Benefit Card Party was held on Friday, March 18, 2016 at the United Lutheran Church from 12:00 to 4:00. New this year, online table registration via our website was used by 70% of the participants, with comments like "thanks for making this easy!". Registration started on Feb. 17, and all 42 tables were sold out in 2 weeks! 4 tables were on the wait list. Phone registration continued to be an option. 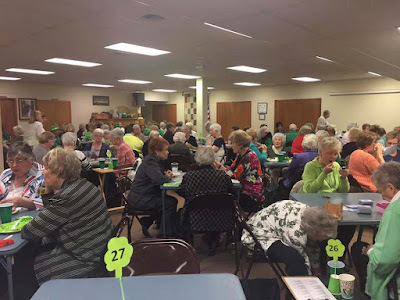 Our 8th Annual Benefit Card Party was held on Friday, March 20th, 2015 at the United Lutheran Church from 12:00 to 4:00. Early registration is always encouraged since the ticket sell out quickly. Since we are noted for our delicious buffet of food, this year was not exception. 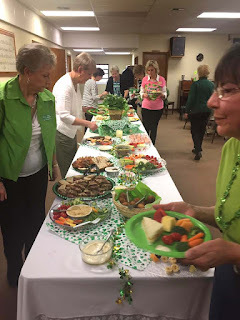 Our members provided delicious finger foods and wonderful deserts. One recipe that was requested by several of the attendees was for the Chocolate Nutty Squares and you will find that under About Us - Recipes. Committee Co-Chairs, Sue Beaty and Judy Jeffrey and their committee members would like to thank all who have made this benefit card party such a success over the years. ... A Sellout Yet Again in 2014!! 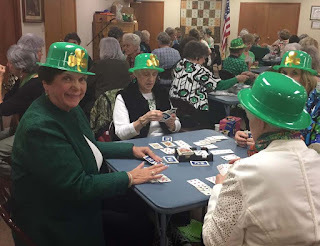 Our 7th Annual Benefit Card Party was moved from the normal November date to Friday, March 7th, 2014 at the United Lutheran Church of Bella Vista from 12:00 to 4:00 PM. As usual, the event was a sellout again with names on the waiting list!! 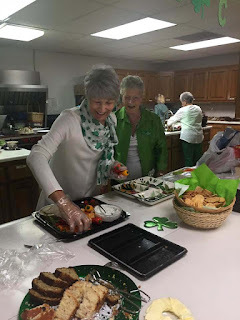 Members provide delicious food and recipes were requested by those attending and will be added to our recipe list. (See recipes below from previous card parties.) Coffee, tea and water are also served. Our generous business people in the community donated the wonderful raffle items and door prizes. Judi Shannon made a beautiful beaded necklace with amulet bag and bracelet set for the raffle. Ticket sales for the raffle reach a new high. The Our generous members donated items for the Garden Club Boutique where they were sold for $10 or less. Everyone always enjoys their afternoon of cards and games! Some comments that have been made by the guests were: "This was the best buffet of food I have ever seen! ", "What is the date of next year's card party?" and "I need the recipe for that!" Committee Chairmen, Judi Shannon and Carolyn Tabat, along with committee members; Geri Hoerner, Linda Neymeyer, Marilyn Russell, Becky Thomas and Cathie Whittenberger worked so hard to make this another successful event. They would like to thank the many members who supported this fundraising event in so many ways!! !